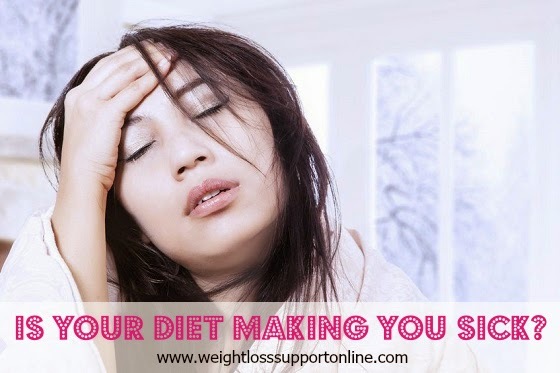 Is Your Diet Making You Sick & Fatter? 3 Things You Need to Know! Working hard to lose weight and failing is one of the most frustrating things in life. Going down a few pounds, back up a few pounds, down a few inches and then back up a few inches ... This yo yo diet affect can really take a toll. Yet, it's nothing to be ashamed of UNLESS you quit trying to accomplish your weight loss goals. If you have tried every diet to lose weight and are not doing well, this information for you. We all understand that one of the most common ways to lose weight is by following a strict diet and exercising, but if it is not working it could very well be that your so called healthy eating habits are affecting your weight loss goals. In fact, it could be that your diet is making you sick. There's nothing wrong with cutting calories, but following a diet plan that is too restrictive can hinder weight loss and make you feel sick. Your body needs a certain amount of calories each day in order to have energy. If you aren't eating enough calories each day then your body won't burn fat as you need, too. This is why you will read and hear people say "don't skip meals while on a diet" or see meal plans where a certain amount of calories are permitted for each meal. For most people, a diet of at least 1200 to 1500 calories each day is a good starting point for weight loss, but the proper amount of calories also depend on your pre-diet weight and eating habits. If you're used to eating around 2500 calories a day and drop to 1200 calories, it can make you sick and / or feel like giving up. This is because drastic food reduction can cause blood sugar levels to drop and then you start to crave certain foods, feel sluggish and ill. Your blood cells and certain organs are affected when blood sugar drops, it also decreases your energy and weight loss results. Instead of going for a dramatic calorie cut and putting yourself at risk of being sick, consider gradually decreasing your food intake so that your body has time to adjust to your new eating patterns. For example, if you eat around 2500 calories a day (typically weighing about 250 pounds) and you diet includes unhealthy / high calorie snacks like cake, ice cream, fast food, cookies, sugar cereals, etc., then you can try decreasing to 2000 calories first and see how that works for you (can help you drop to 200 pounds). You can easily drop those extra 500 calories a day by replacing some of the bad food choices with healthier options. You will not feel as deprived as you would on a 1200 or 1500 calorie diet. If you are used to eating 2500 calories of food (not so many snacks) and 2000 calories is too hard at first, then start by dropping in increments of 200 calories at a time. For example, if you are eating 2500 calories then drop to 2300 for a while (until you lose 20 pounds), then drop to 2100 calories (until you lose another 20 pounds / 40 total) and then drop to 1900 calories (until you lose another 20 pounds / 60 pounds total) and so on until you've reach the optimal calorie level for goal weight. You won't feel as deprived by weaning down calories and can keep your body at optimal energy level. If you exercise in addition to watching what you eat, you can modify your calorie intake accordingly. For example, if you're eating a 1500 calorie diet and burn 464 calories on the Elliptical trainer, then you can eat those calories back to maintain the 1500 calories. Many people will notice they need to maintain at least 1500 calories because weight loss will stop even though watching diet and exercising; one of the reasons could be that your body needs that fuel to continue losing weight! Make sense? Struggle with portion control? Check out this handy Portion Control Tool that you can use daily to gauge how much you're eating each meal. Need help controlling your appetite AND keeping your body a cleansed fat blocking machine? The Ingredients in Skinny Fiber help immensely with those goals; especially with the power of the digestive enzymes in the product. Think water isn't that important to weight loss and health? Think again. Whether you're dieting in combination with an exercise plan or you're simply following a strict eating schedule, make sure that you're drinking plenty of water. If you become dehydrated, your body will have to work harder for you to lose weight and not enough water can stall the weight loss in general. Drinking 1/2 your body weight in ounces of water is best for hydration. If you are not currently drinking that much water, then increase your water intake if trying to lose weight and always drink water during a workout. If you feel thirsty while you're losing weight, remember to grab your water instead of opting for sugary or diet sodas. Drinking filtered water throughout the day from a BPA Free Reusable Bottle is healthier and can help you drink enough water each day. If you struggle with drinking enough water each day, you can make delicious Infused Waters to add flavors naturally. These also help with detox / cleansing and energy depending on which ones you make. Here are some healthy drink and infused water recipes - Just click the pictures and look to the right, the ingredients and instructions are there for you to LIKE, SHARE to your page and SAVE for when you want to use them. OK, so there you have the 3 major eating tips to help make sure your diet is not making you sick. Plus, some extra resources that can help you follow these health and weight loss tips. I hope that you found this helpful; please SHARE by using the Social Share Buttons to save and give to friends.